· Driving Coach - Monitor your driving habits to improve fuel economy. · Engine Temps - You'll want to keep an eye on your Engine Temp. No problem the GT will provide you live accurate figures. · Transmission Temps - When your out an about putting your Jeep through its passes keep an eye on your Transmission Temperatures. · Engine Load - Off -Roading in any form will put different amounts of load on your engine. 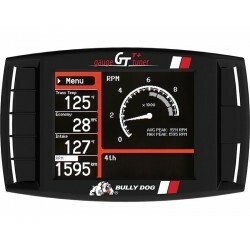 The GT gives you instant feedback on engine load. · Power Tuning - There are times when you just need more power. Select the Power Tune. · Off -Road Tuning - When you head off -road this tune will give you more power and more control of the throttle for challenging terrain. · Gear Ratio Calibration - If you upgrade or change your axle ratio you will need a GT to program your new settings. · Tire Size Calibration - Upgraded your wheels and tires? Now you can calibrate your speedometer. · TPMS Tire Pressure Monitoring System - Drop your tire pressure and you'll get a light on your dash. Not anymore. · Idle Up - We all get stuck at some point. Idle up to power that winch. · Engine Fan - Turn your engine fan off for water crossings. Or run the engine fan in high speed mode at any temp. · Lockers - Increase traction by engaging your lockers in 2WD, 4WD Hi and 4WD Low up to 30mph. · Traction Control - When it gets muddy you'll need to disable your Traction Control completely! Available at the click of a button. · Sway Bar Disconnect - When you need increased articulation disconnect your sway bars in 2WD, 4WD Hi and 4WD Low up to 30MPH. Fits all JEEP Applications listed below. If your Jeep isn't listed, then this is not the right model.